Budgetary deficits may be an inevitable reality for countries that use financial stimulus packages to revive their economies, Prime Minister Stephen Harper said Saturday. Budgetary deficits may be an inevitable reality for countries intending to use financial stimulus packages to revive their economies, Prime Minister Stephen Harper said Saturday. 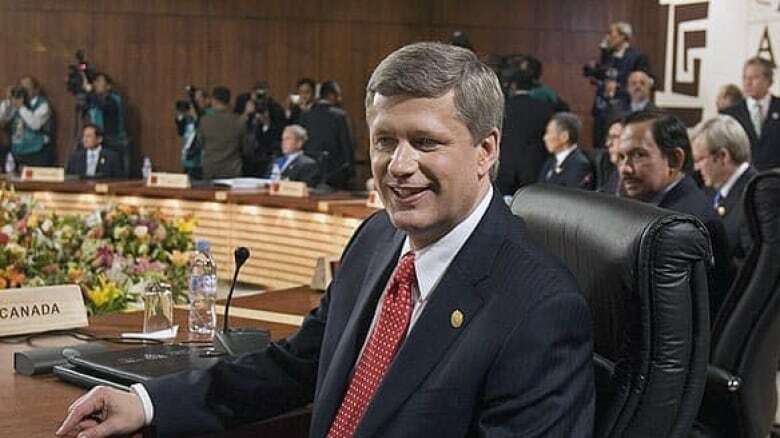 During a speech at the Asia-Pacific Economic Cooperation forum in Peru, Harper suggested the Canadian government will introduce a stimulus package to boost the economy while trying to avoid setting the stage for a long-term government deficit. Signalling a shift in his usual anti-deficit stance, he acknowledged that countries that choose to implement fiscal stimulus packages will likely find it necessary to run budgetary deficits. "We did agree at the G20 [summit in Washington] last week that additional fiscal stimulus should be used to sustain global demand if monetary policy continues to prove to be inadequate," Harper said in Lima. "These are, of course, the classic circumstances under which budgetary deficits are essential." It was an about-face for the prime minister, who in the lead-up to last month's election dismissed the possibility of a deficit, saying they were addictive and out of the question for Canada. Harper said Saturday that whatever short-term new spending his government pursues, it "will ensure that Canada does not return to long-term structural budgetary deficits." "We reiterate our firm belief that free market principles, and open trade and investment regimes, will continue to drive global growth, employment and poverty reduction," the statement says. "There is a risk that slower world growth could lead to calls for protectionist measures which would only exacerbate the current economic situation." The statement comes on the heels of a broad plan adopted by leaders at last weekend's G20 summit in Washington, and goes one step further by pledging not to impose additional economic trade barriers in the next 12 months. Leaders also pledged to reach agreement next month on the outline of a World Trade Organization pact that collapsed in July after seven years of negotiations. Concern over the global financial crisis injected new urgency into the so-called Doha round of trade talks. Harper also used his speech to send a message that a freer trading system is the best way to restore global economic prosperity, saying the world is entering an economic period that is "potentially as dangerous" as anything the world has seen since 1929. The Great Depression of the 1930s was not caused by a stock market collapse but by government policies and protectionist trade barriers that followed the crash, Harper said. He criticized policymakers of that time for allowing the banking sector to contract and deflation to take hold, then trying to manage the problem by balancing government budgets instead of providing financial stimulus. "Notwithstanding our current difficulties, the prosperity generated around the world in the last part of 20th century, and the beginning of the 21st century, has been unprecedented in history," Harper said. "Removing protectionist barriers and easing trade restrictions was a big factor in ushering in this extraordinary era. …We cannot allow ourselves to turn back." Countries around the world should be "vigilant" against the rise of protectionism as they grapple with their slowing economies, he said. Canada is committed to "pursuing mutually beneficial economic relations with like-minded nations" around the world, Harper said, pointing to a free-trade agreement signed this year with Peru, as well as a similar, tentative agreement with Colombia, announced Friday night. "When it comes to Canada's support of free and open economies and markets, our view is based on the success of our North American partnerships," he said. "We took a close and trusting relationship with the United States and we transformed it into the most successful commercial partnership in the history of the world." Harper and outgoing U.S. President George W. Bush held a bilateral session earlier Saturday, where they discussed the economic slump, the Detroit-Windsor bridge and Canada's concerns about new U.S. rules requiring meat and fresh produce to be labelled by country of origin, the Prime Minister's Office said. The Canadian livestock industry has complained it is being hurt by U.S. labelling rules. Harper and Bush also reflected on the work they've done together, with the prime minister saying there were many things the two had agreed on and a few they hadn't, but that Bush was always willing to listen. For his part, Bush called Harper a good friend and a strong leader.